Look what else came to light following the treasure trove of Be-Bop Deluxe and Lynyrd Skynyrd photos hiding within Guy Peellaert’s Rock Dreams…a host of Planet Wilson negatives from a photo shoot to promote our albums, In The Best Of All Possible Worlds and Not Drowning But Waving. So, here we are, Hal and Grant and I. If anyone remembers the photographer/s please let me know and I’ll add a credit. It was used in a really ace review from David Cavanagh! 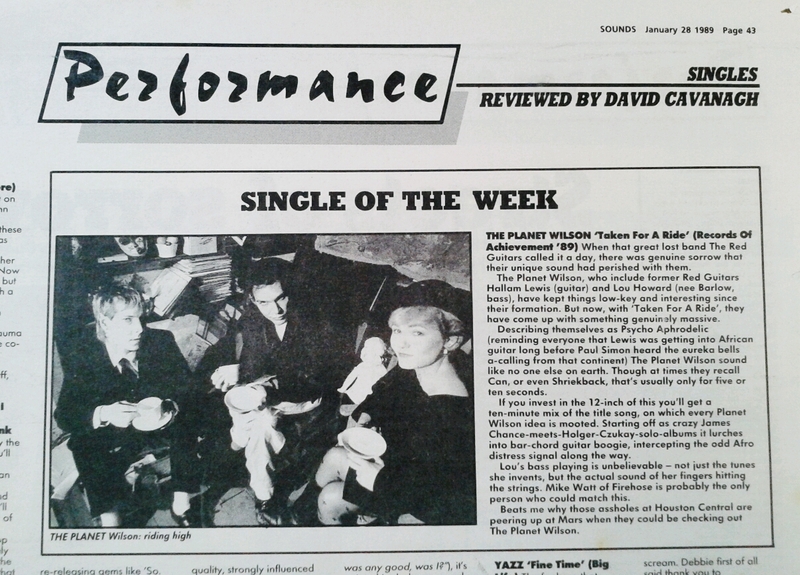 From Hull Music Archive: The Planet Wilson – Hallam Lewis (guitar and vocals), Lou Duffy-Howard (bass guitar and backing vocals) and Grant Ardis (drums). The Planet Wilson were an indie rock band from Hull formed in 1985 by two former Red Guitars band members, Hallam Lewis (guitar and vocals) and Lou Duffy-Howard (bass). Described by Sounds’ David Cavanagh as ‘Crazy James Chance meets Holger Czukay’ they were signed to Virgin Records and released two albums in the late 1980s. They were joined by Grant Ardis and latterly for gigs by drummer Jonah Lacey-Hatton, sax and keyboard player James Gillespie, backing vocalist Alison Owen and percussionist Andrea Barbadori. In 1988 they released the album ‘In the Best of All Possible Worlds’ (produced by Steve Nye for Virgin Records) on which, according to Trouser Press, “…the three band members occasionally seem to be playing different songs”. In 1989 their second album ‘Not Drowning but Waving’ was released on Records of Achievement. With a cut out album sleeve raised from the fiery depths by Demon O’Connor, Trouser Press described the album as “uncommon pop music with claws”. Brilliant photos – what a find!